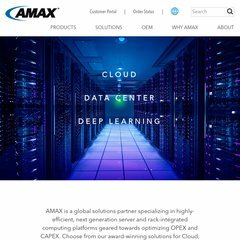 Topics: Order Status, Amax China, Big Data, Phat-data, and Cloud. amax.com AMAX : Enterprise Computing | Servers, Storage, Workstations and ..
amax.com AMAX HPC Solutions Optimized for NVIDIA Tesla M2090 GPU Computing ..
amax.com AMAX : GPU Computing Clusters, Workstations, Servers and HPC ..
Vianet Communications (California, Mountain View) is the location of the Microsoft-IIS/7 server. Its 2 nameservers are ns75.worldnic.com, and ns76.worldnic.com. It is written for ASP.NET language.